I first became aware of this story some years ago. What remains long after you have read it, is the heroism of the people involved, the unwavering commitment to save life, no matter what the effort, and the absolute belief, against all odds, that you will succeed. I am grateful to John Lerwill for permission to re-publish this account, and to E.J. Fisher, the author of the article, for his enlightening account of this event. On 12th January 1899 Edward Pedder, who owned the post office in Lynmouth, received a telegram for Jack Crocombe, which he passed to the latter at 7:52p.m. 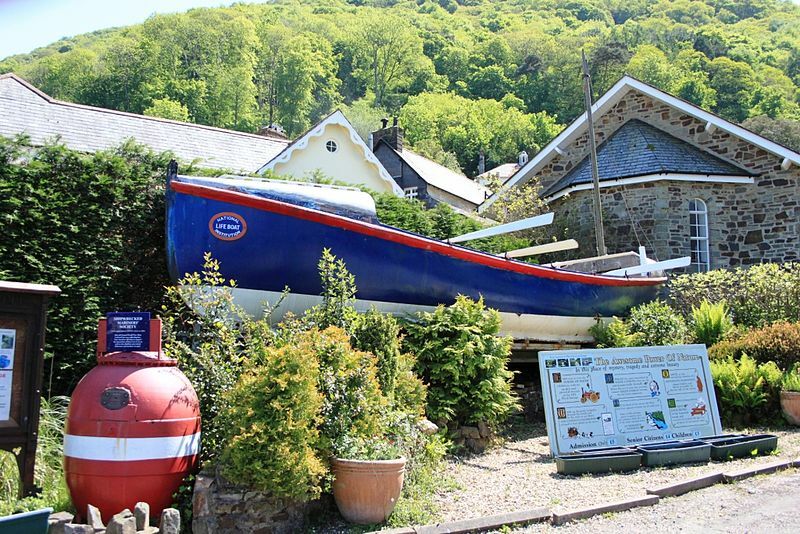 Jack was coxswain of the Louisa, the Lynmouth lifeboat, and the telegram reported that a large ship was drifting ashore at Porlock Weir. Watchet lifeboat station reported shortly afterwards that severe weather prevented them from launching their boat, so the Lynmouth boat was the ship’s only hope. A gale had been blowing all day and had already flooded several houses and a shop in Lynmouth, and it was clear that the boat could not be launched at Lynmouth. Not to be beaten, the coxswain proposed to take the boat by road to Porlock’s sheltered harbour, and launch it from there. This meant using whatever horses and men could be obtained to haul the boat and its carriage (which together weighed about 10 tons) the distance of 13 miles, including climbing up the 1 in 4½ Countisbury Hill, reaching a height of 1,423 feet above sea level, and later taking it down the 1 in 4 Porlock Hill. 20 horses were brought from the local coach proprietor, and six men were sent ahead with shovels and pickaxes to widen the road. The combined efforts of the horses and 100 local men eventually brought the boat to the top of Countisbury Hill, where a wheel came off the carriage and had to be put back on. Most of the helpers gave up at this point, leaving only 20 to help the crew for the rest of the journey. At one stage the road was too narrow for the carriage and could not be widened, so the boat was dragged on skids while the carriage was taken off-road over the moor to get round the obstacle. Porlock Hill was especially dangerous, but with the horses, and all the men using ropes, to hold the carriage back they managed to get down safely, only to meet another obstacle. Here a garden wall blocked the road. The old lady who owned the property was not pleased to be woken in the early hours by the noise of her wall being demolished, but when she discovered the cause agreed to a corner of her cottage being removed as well to let the carriage through. The next problem was finding the road to the coast was impassable as a result of a sea wall having been washed away. During the diversion onto a higher road they had to fell a large tree, but they eventually reached Porlock Weir at 6:30a.m. The crew were, of course, soaked, hungry and exhausted, but immediately launched the boat. It took an hour to reach the ship, which had drifted dangerously close to Hurlstone Point. It was the Forrest Hall, a 1,900 ton ship with a crew of 13 men and 5 apprentices, on its way from Bristol to Liverpool. The ship had been under tow down the Bristol Channel because of the headwind when the cable snapped and the rudder was washed away. Since the ship was safe as long as the anchors held, the lifeboat stood by until daybreak, when the original tug appeared. The lifeboat was used to get a line from ship to ship, and some of the lifeboat crew even went aboard the ship to raise the anchors because the ship’s crew were too exhausted to do it. A second tug was needed to avoid drifting into Nash Sands, but eventually the ship was towed safely to Barry, accompanied by the lifeboat in case the cable snapped again. Darkness had fallen by the time they docked at Barry. Edward Pedder, the post office owner, also sailed in the boat. Four of the horses used died as a result of their labours on the journey.